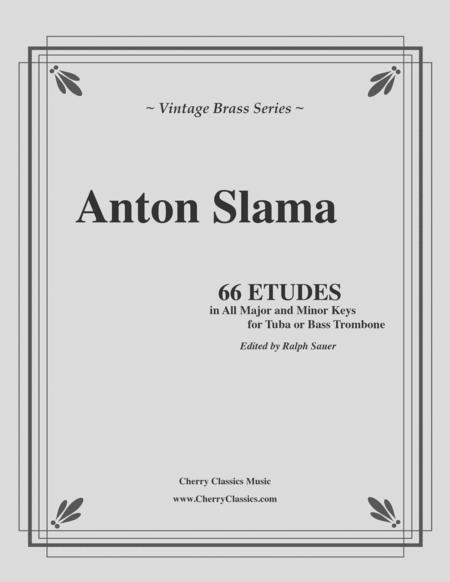 The Slama 66 Etudes have been used for over 90 years as a tried and true method for learning all of the major and minor keys on bass clef instruments. It is an excellent book for honing the basics of technique and gaining knowledge of all the scales. This new improved edition has been carefully edited by Ralph Sauer, eliminating many misprints and articulation conflicts. In the transposing of Professor Slama's music into the appropriate range for Tuba and Bass Trombone, Mr. Sauer has placed the etudes in a different order from the original Trombone method. However the book starts in C major and methodically proceeds through all of the keys in order to give the performer all of the tools necessary for a thorough technique on his or her instrument. We can recommend this method book for all students of intermediate level and above.